Twelve Monkeys Vapor Co. was conceived be to a premium e-liquid line that brings you some of the best tasting flavors on the market. We strived to hit the balance between quality ingredients and artisanal production processes while offering the consumer a reasonable price. We curated high quality flavouring ingredients and base materials into the development of our e-liquids. Our e-liquids undergo the strictest of user acceptance testing which we hope you will agree with us is a line of liquids that tastes great in tanks as well as in rebuildables. All of our flavours are high in VG; with a minimum of 70% VG; each flavour has a different VG/PG ratio tailored specifically for the flavour components used. All our liquids are made in Canada, in a laboratory setting utilizing laboratory equipment and processes. Every flavour is pre-steeped for 2 weeks prior to bottling and put on sale. As result, the e-liquid produced will have a more consistent flavour but limits the availability of the product due the process we have adopted. At Twelve Monkeys Vapor Co. we believe in quality over quantity. 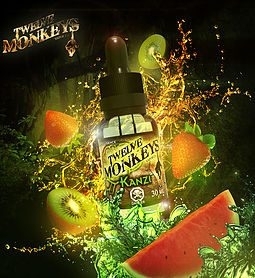 ​ Twelve Monkeys Vapor is proudly the recipient of the Best New Brand Award of 2015, voted by international fans on the Ecigclick Vape Awards.